Bring up your favorite browser, go to calibre's website, and download and install calibre. The installer doesn’t have any options. Tap or click Finish, and run calibre for the first time. 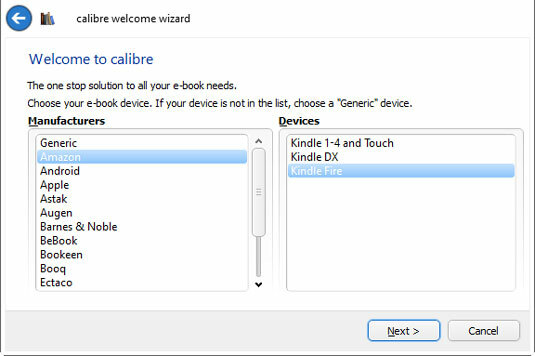 When calibre asks for your e-book device, don’t panic — it converts any format to any other. This just sets up things so calibre knows which format you favor and makes it easier to choose your most common format. calibre scans your Documents library for books — just about any format you can imagine — and lists each book. Note that calibre lists books, not files. If you have a book that’s in two different formats — say, a MOBI file and an EPUB file — it appears as only one book on this main screen. To see the details about an individual book, right-click it and choose Edit Metadata, Edit Metadata Individually. (Someday, calibre will have a touch option; for now, it’s mouse only.) calibre shows you an enormous amount of information about the book, including the formats that are available. 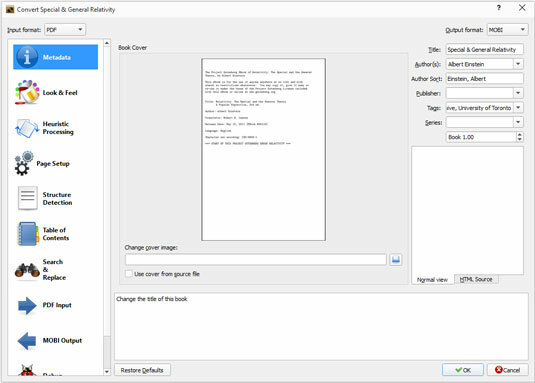 When you’re finished looking at, or modifying, the data, close the book’s dialog box. You return to calibre library. To convert a book to a different format, right-click the book and choose Convert Books, Convert Individually. A Convert dialog box appears. In the upper right, choose the format you want to convert the book to; in the lower right, tap or click OK.
calibre converts the book to the format you choose and places the new file next to the old ones.